It’s Friday! I am so glad Friday is here, how about you? By the end of the week, I am always exhausted, and I call Friday after work my big nap day. Mr. 5 year old and I usually cuddle up and take a nap after school. Not today though. My daughter is in her high school’s production of Legally Blonde. They opened last night, so I will be seeing that play 3-4 times before it is over. Tonight, I am serving as an usher. So, wish her luck! I have had a couple of plates sitting around here that I wanted to hang for a about a month now. Well, over the weekend I finally got them hung, without buying anything to hang them with! Sometimes I really impress myself, ha! I have seen several methods for hanging plates on different blogs. So I decided to try hanging them with what I had. These are the plates I hung. I used some left over fabric scraps, a paper clip, and a hot glue gun. I cut a square of fabric, then I folded it in half. I hot glued the bottom half to the plate, then I stuck the paper clip on the inside of the folded fabric, put hot glue all around the edges, stuck the paper clip right onto the top edge, and folded the second half over into the glue I made sure enough of the paperclip was sticking out to hang onto the wall. After I folded the fabric over the paper clip, I put a dollop of hut glue right at the top Just for good measure. I painted this plate at a Pottery Painting Place. I decided to hang it on this little wall in my kitchen. The cafe curtains I made have the same color of blue in them. I bought this little plate recently on clearance at a Cracker Barrel store for $3.99 I hung it on my gallery wall in the hallway. I bought the little letter plaque at Kohl’s. This way of hanging a plate on the wall is so much cheaper than actually buying something to hang them with. I am so glad I tried it! It didn’t cost me a dime. Have a good weekend! 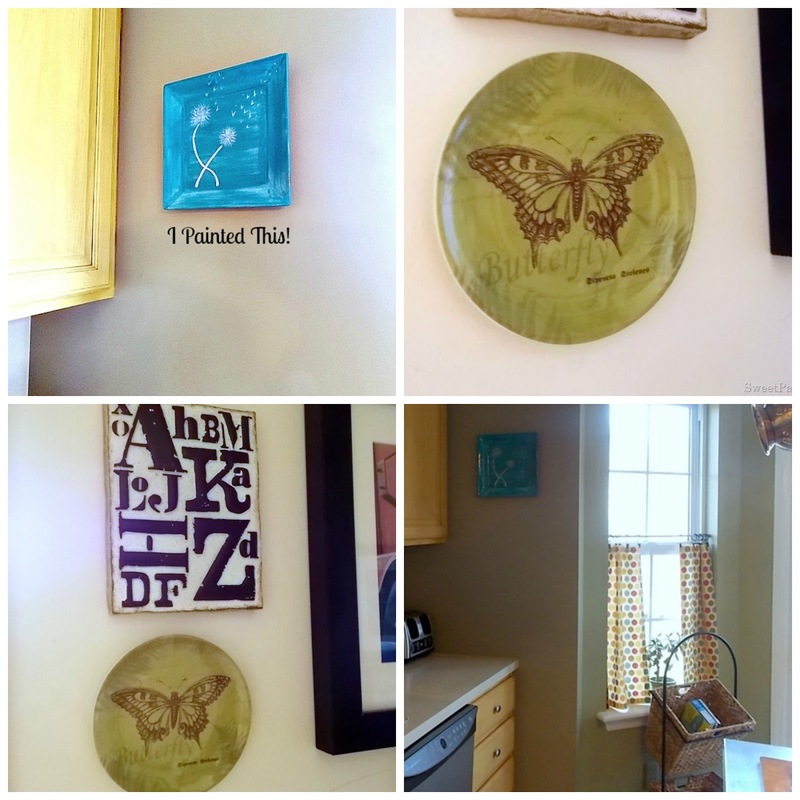 Hi Nicki, found you on Hometalk, what a nifty idea for hanging plates and artwork!! Thanks Amy,I am glad you visited my blog! This is a really great idea! Just found you from Google+ I look forward to seeing what other creative things you come up with. Thanks Pat! I am certainly no artist, but I like the way it turned out! Great idea! I have a few plates myself that I am going to try this out on! I never would have thought to use some fabric scraps, hot glue and a paper clip! Awesome! Thanks for sharing…..and by the way I love the plate that you painted! Very pretty! Jessica, thank for visiting my blog! I like the plate too, although I am definitely no artist! Thank you so much! Those curtains were out of my comfort zone, but I like the way they turned out!